Enter the Restaurant of your choice with their phone number. Please enter a detailed description of what you would like to order. If you would like a Hookah with your food , click here after you submit your food form. Roma Bakery specializes in Middle Eastern breads and pastries. Some of the items offered include﻿ cheese, basil pastries and baked Zataar﻿. It is recommended to pre-order your food because of the high traffic. The bakery also offers pre-made items in the deli counter and has a few tables and chairs. 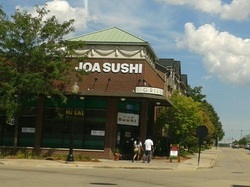 Gold Sushi offers a variety of sushi and Japanese dishes. Best sushi in town! All major credit cards and cash accepted.